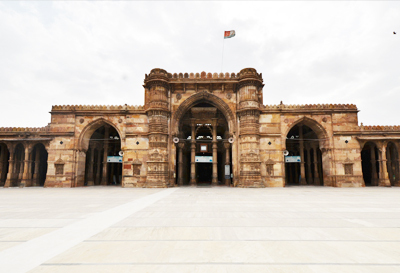 Constructed gracefully by Ahmed Shah I in the year 1423, Jama Masjid is a hollowed Islamic shrine lying within the old city region of Ahmedabad, on the western side of the Manek Chowk. 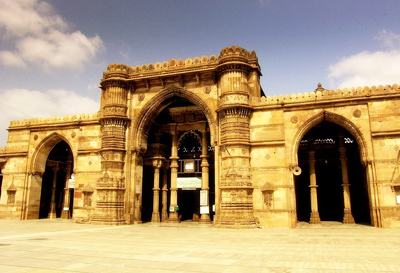 Popularly known as Jama or Jumma Masjid, this beautiful monument in Gujarat is a testimony to the maturity Muslim architecture has received. The masons who created this magnificent yellow sandstone structure ingeniously used pieces retrieved from demolished-Hindu and Jain temple- the black slab close to the arch is said to be the base of inverted Jain idol. 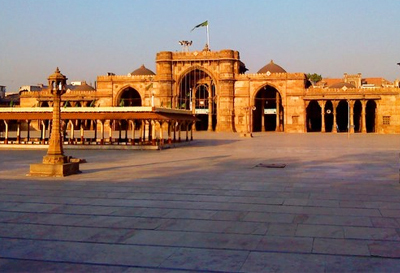 Jama Masjid was probably the largest mosque in the Indian subcontinent built in this period. Exteriors of the mosque are extremely impressive. Its facades are the harmonious blend of solids and voids. The unique feature of Jama Majid is its three archways in the facade that have been skilfully balanced and placed. Interior of the mosque is illuminated by natural light filtered through latticework screen. Sanctuary of the mosque consists of nearly 15 domes and 300 pillars that are standing shoulder to shoulder with each other. The spacing between the pillars of the mosque forms a series of a square bay which are crowned by a domed roof. Majestic interiors are quite similar to its exteriors. Decorative details like intricate terraces, beautiful arabesque, and richly carved terraces enhance the interiors of the mosque. 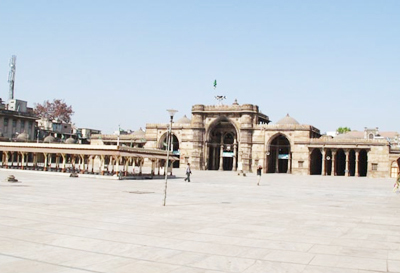 James Fergusson, a prominent historian, observed Jama Masjid's resemblance to Ranakpur Jain Temple. He observed that both the temples belong to the same school and that while there is more poetry in the temple and sobriety about the plan of the mosque.